With Fallout 76 announced to launch early November '18, I thought we should get the ball rolling for when the vault doors open. 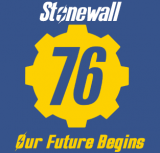 Fallout 76 will be an online game that lets you build up a community/camp with the help of friends (Hopfully you'll Join the Stonewall 76er's). Pick up arms to defend it from other wasteland players, scavange for materials and food, team up to go on nuclear raids.